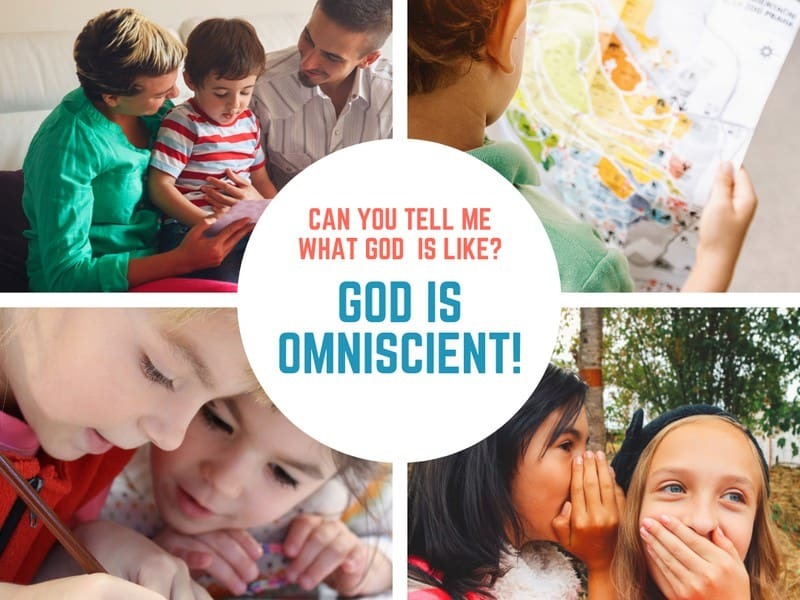 In this lesson from Acts 4-5, children will learn that God is Omniscient . This is lesson 26 of 42 in our study on the Attributes of God called “Can you tell me what God is like?” Visit the series index to view all the lessons and get more ideas for using this curriculum in your children’s ministry. Bibles, previous attribute of God posters, a large piece of paper with the words GOD IS OMNISCIENT written on it, key verse (1 Samuel 2:3) printed on a piece of paper, blank paper and markers or colored pencils for each child in the group. Ask if anyone can remember the truths we’ve learned so far. As a quick review, do a few of the motions and see if the kids in the group can tell you what that motion teaches us about who God is and what God is like. Ask if any of the kids in the room are all knowing. Explain that there are some people who act like “know-it-alls”- that means that they act like they know everything and they always have to be right m but that it is impossible for a human to know everything, just like being limited by time and space, we have limited knowledge. I might know everything there is to know about multiplication and can do all kinds of math in my head, but there are lots of things I can never know. Have kids help you think of some random things that we could never know: how many grains of sand there are in the desert or how many hairs are on my head (which the Bible says God knows) or the names of the stars that we can’t even see with the strongest telescope, etc. Tell the kids that you want to walk them through a story that should help them understand more about the truth that God is all knowing. In the early church (the first few years after Jesus returned to heaven) all of the people shared everything they had with each other and took care of each other’s needs. People were known to sell their things and bring the money to the church to help those in need. No one was selfish. A man named Barnabas sold a piece of land he owned and brought the money to the apostles so they could use it for the church to meet the needs of the people. A man named Ananias and his wife Sapphira sold their land as well. Ananias brought part of the money to the church acting like it was all of the money. God told Peter that Ananias was lying and Peter accused Ananias of lying. Peter said that since the land was his he could have done anything he wanted to with the money and it would have been fine to say that you want to give some of the money, but that what he did was lying to God. Ananias fell down dead right then and there. Some men took his body and buried him. Three hours later, Sapphira came and didn’t know what had happened. Peter asked her how much they sold the land for and she told him the partial amount that Ananias had brought in to the church. Peter accused her of lying and told her that her husband had just died after being caught lying. Then Sapphira fell down dead as well. God knew their hearts and He knew that they were lying. No one could have known and even though Ananias and Sapphira were able to trick other people with their lies, it’s impossible to lie to God because He knows everything. Finish the story by reading Psalm 139:2 & 4 as a reminder that God knows our thoughts and knows what we’re going to say before we say it. EXPLAIN: Ask the kids if there is anything that God doesn’t know. Remind them of the story and how God knew what was in their hearts and knew they were lying to Peter and to God. Ask if we can ever lie to God. No, He knows our thoughts so its impossible to lie to God. Since motions & actions help kids remember, choose an action for OMNISCIENT. A good motion might be to tap the side of your head with your finger like you’re saying that you know something. SAY: “This week’s memory verse is 1 Samuel 2:3. In this verse we see that God knows our thoughts and our deeds. God knows everything about everybody because God is OMNISCIENT. Remind the kids that this morning we talked about the truth that God knows everything that that includes our thoughts and heart motives. This is one of the reasons why sin is such a HUGE problem. We need to remember that our sin is actually against God. When we tell a little lie, or do something in secret that no one will ever find out about and think we’ve gotten away with it, we need to remember that God knows our hearts. That’s why Jesus taught that just calling your brother a fool is the same as killing him, because in your heart you are thinking evil thoughts about him. When we consider our thoughts as sin, its obvious that we are all sinners. The sin in this story wasn’t keeping the money, the sin was thinking they could trick God and the church and make themselves look good. Thankfully, Jesus came and died on the cross for our sin. We can’t live the life that God calls us to live on our own, but when we follow Jesus He’ll change our hearts and start to make us more like Him so that we obey a little more every day. Give each child a blank piece of paper provide markers or colored pencils. Encourage them to write the word omniscient somewhere on the paper and then write or draw something to help them remember this attribute of God. They could write the definition for omniscient or the memory verse or they could illustrate the story they heard and write something about God knowing their thoughts. After a few minutes, bring the group back together and give kids time to share what they have drawn or written. Pray that the kids in the group would come to know God more and more each week through this study and that they would remember that all of us are sinners who need to be saved and that they would turn to this good God for salvation. Thank God for teaching us about Him through this study so that we can come to know Him more and more. Tony Kummer (Editor) reviewed & updated this page on : April 8, 2019 at 10:15 am. All our content is peer reviewed by our readers, simply leave a comment on any post suggest an update.